Casio announced today that it will release two new flagship models in its lineup of electronic keyboards, the MZ-X500 and MZ-X300. Loaded with a diverse range of preset sound patches and rhythm patterns, these top-of the-line instruments are suitable for all kinds of musical genres. Both new Casio flagship keyboards MZ-X500 and MZ-X300 comes with built-in speakers driven by dual 20-watt amplifiers for a big, powerful sound. The Casio MZ-X500 features 1,100 preset tone patches and 330 rhythm patterns, while the Casio MZ-X300 has 900 preset tone patches and 280 rhythm patterns. With these abundant sound and backing-track options, users can not only select musical instrument patches to fit a performance style, such as guitars or basses, but also choose from many different rhythm patterns ranging from standard beats used in rock, jazz, and pop music to ethnic rhythms from various regions of the world, including Latin American and Indonesian styles. 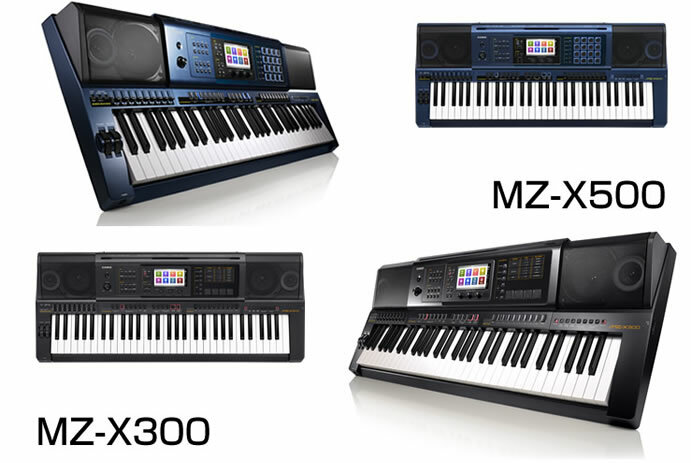 Suitable for practically any musical genre, both the Casio MZ-X500 and MZ-X300 are capable of 128-note polyphony, enough to ensure that notes can be played smoothly without cutting out during a performance, and feature digital signal processing (DSP) effects that have been programmed based on 20 types of algorithms. Casio MZ-X500 and MZ-X300 are fitted with a four-band parametric equalizer for precisely adjusting tone; both keyboards offer everything that a user would hope for to perform at his or her very best. Casio newly equipped the MZ-X500 with 16 touch-responsive multi-pads for broadening performance capabilities. The pads can be used to trigger preset patches and samples created by the user, as well as to play back musical phrases, allowing the user to enhance a performance with percussive hits and additional melodies while also playing the keyboard. Auto accompaniment chord progressions can also be assigned to any of the 16 pads, enabling the user to play chord progressions just by striking a pad. This eliminates the need to play chords continuously with the left hand so the user can focus on playing melodies. Casio equipped both the MZ-X500 and MZ-X300 with a touch panel-capable large color LCD to enable better operability and more intuitive control. This lets users call up and modify any of the vast number of sound patches and rhythm patterns with ease.